Mermaids and Merwomen in Black Folklore / "Each piece is a storyteller, using color, texture, form and embellishment to express a narrative"
The Liberator Magazine proudly sponsors Mermaids and Merwomen in Black Folklore: A Fiber Arts Exhibition -- on view at the City Gallery at Waterfront Park in Charleston, South Carolina, from Aug. 28 through Oct. 28, 2012. 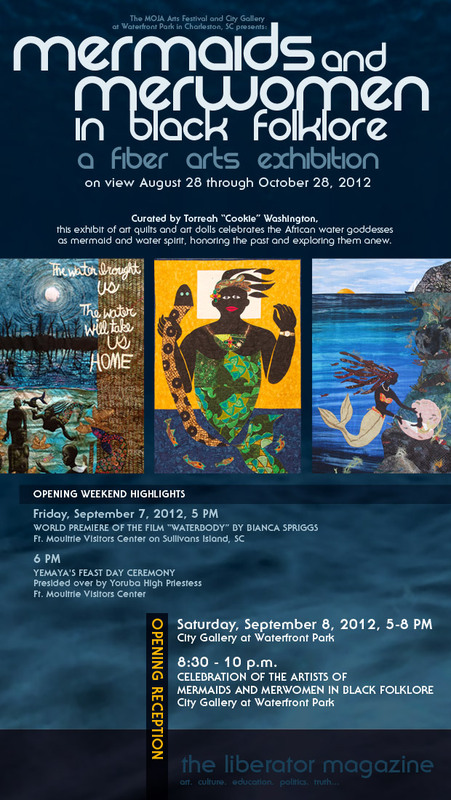 Opening reception: Saturday, Sep. 8, 2012 from 5-8 p.m.
Info: "African merfolk first appeared in the millennia-old belief of the dwelling of water spirits in Western Africa. With the increasing contact between Europe and Africa of the time, these legends eventually combined with traditional European myths of mermaids. Thus, African water-spirits evolved from a representation as half-human, half-creature, to being popularly depicted as a half-fish, half-woman. Beginning in the 16th century with the arrival of enslaved Africans on the Atlantic slave trade, their traditions, beliefs and practices honoring their ancestral water deities were transplanted into the United States. Tales of capricious female water spirits evolved into stories describing anything from wrathful sea creatures brewing great storms to harm the Carolina Sea Islands to mermaids acting as obliging "fairy-godmothers." Today, African-based faiths honoring black merfolk still thrive, and new communities of color have reestablished and revitalized African water-spirits in their art. Quilting and doll-making traditions have undergone a renaissance. No longer are they considered utilitarian tasks, but are now emerging as works of art -- demonstrating the revisualization of African mermaid myths. Curator Cookie Washington states, "Each piece is a storyteller, using color, texture, form and embellishment to express a narrative."